It's a lion and a zebra all ready to dine on these adorable stamped cross stitch bibs. Who could resist such sweet faces. Kit contains cotton thread, two poly / cotton bibs printed in wash-away ink, needle, and easy instructions. Designer: Debra Jordan Bryan.. 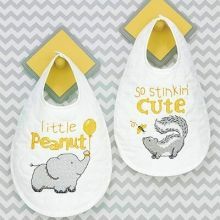 These Stinkin' Cute Bibs by Dimensions make cute and quirky cover-ups for outings. Our stamped cross stitch bibs would make a great shower or newborn gift. Designed by Cathy Heck. © Cathy Heck. Finished size: set of two approx. 9.5" x 15.5" (23,5 cm x 39,5 cm). Kit contains presorted thread, two white baby bibs with hook and loop closure printed with ink that fades with washing, needle, and instru.. Cute Bibs. Finished size: 9" x 14", set of 2. This stamped cross stitch kit contains: Presorted thread, 2 Muslin bibs (50% cotton / 50% polyester) printed in wash-away ink, Needle, Easy instructions.. These cute creatures are hungry, too! These stamped cross stitch Kimba Bibs by Dimensions make mealtime fun. Finished size: 9 x 14, set of 2. Designed by Shelly Comiskey. © Simply Shelly, Inc. This stamped cross stitch kit contains: • Presorted thread • 2 Muslin bibs (50% cotton / 50% polyester) printed in wash-away ink • Needle • Easy instructions..
Noah's animals are arriving two by two on these sweet stamped cross stitch bibs. Colorful critters arriving two by two! Our adorable baby bib kit features two prefinished bibs with X's for stitching that fade when washed, cotton thread, needle, and easy instructions. Kit contains cotton thread, two poly/cotton bibs printed in ink that fades with washing, needle, and easy instructions. Finished Siz..